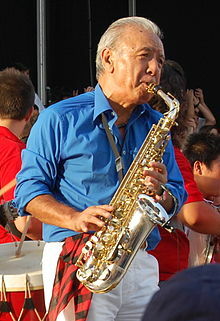 Sadao Watanabe is a Japanese musician who plays the alto saxophone, sopranino saxophone and flute. He is known for his bossa nova recordings, although his work encompasses a large range of styles with collaborations from musicians all over the world. He has had 13 albums reach the top 50 billboard charts and 2 within the top 10. He has also had numerous albums reach number one on the jazz charts. Among his more prestigious awards are the Order of the Rising Sun, the imperial medal of honour for his contribution to the arts, numerous cultural awards from around the world, the Fumio Nanri award and his cities first honour award. Born in Utsunomiya, Japan, Sadao first began learning music at the age of 18 and started performing professionally in 1953. By 1958 he had established himself as a world-class saxophonist having performed with leading musicians and quartets. [ In 1962 he left Japan to study at Berklee College of Music in Boston. In 1995 the college awarded him an honorary doctorate degree for his contributions to music. In addition to his musical career, Watanabe has also published six photography books in Japan.